Spicebush Swallowtail lands on the ground at Dan's Mountain WMA. 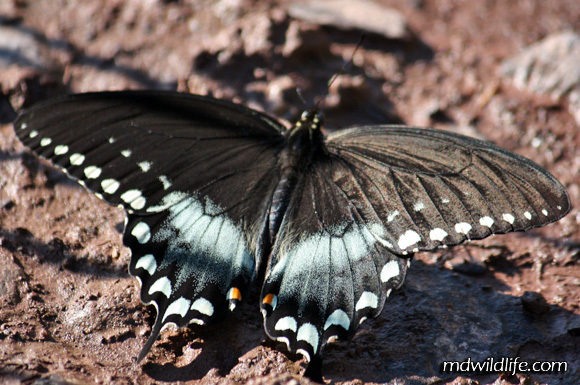 The Spicebush Swallowtail (Papilio troilus) is one of three dark swallowtail butterflies extremely common in Maryland. 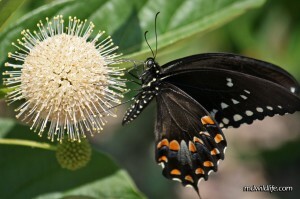 I think that I may see the Spicebush more often than the Black and Pipevine swallowtails, but it’s so hard to know. The Spicebush stays close to the ground usually. It’s flight is very smooth and easy and it may land on the ground at times. A Spicebush Swallowtail in the butterfly garden at Eastern Neck Island Refuge. It’s a large size and can be found anywhere in the state. Just as an FYI, continentally speaking, the Spicebush’s range lies somewhere between the Black Swallowtail, which may venture as high as Maine and Canada and the Pipevine, which sticks to the south eastern United States. The photos on this page range from Dan’s Mountain to Idylwild to Eastern Neck Island and I’ve seen the Spicebush at Sideling Hill, it’s really found all over the state. Summer months are the best time to catch one. 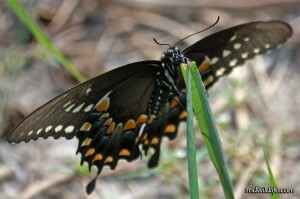 The top wing of the Spicebush is more striking than that of the other two dark swallowtails, in my opinion. The white markings on the wing’s edge are thick and strong all the way up to the wing tip. Both the male and female also sport the small orange mark at the inside tip of the hindwing, which the Pipevine does not have. A Spicebush Swallowtail gets to work at Idylwild WMA. So, there are a few features from the top-wing view that can help you to differentiate. The bottom wing is where the Spicebush contains an extremely striking difference. It’s not always visible to the naked eye while observing one, but if you can snap a picture or get in close to see the pattern of orange and blue marks on a Spicebush’s wings, you will notice a long protruding blue cone shape. The blue mark has a tooth-like shape and is a dead giveaway within the otherwise orange pattern. This blue marker differs greatly from the patterns observed on the underside wings of the Pipevine and Black swallowtails. The images to the left and above display the mark very clearly.